ing flame will be longer in duration.) The escaping flame tends to burn tiff or dry up the lubricant applied to the case. Tight oil is particularly subject to this burning or drying action. The thicker films formed by heavier oils or grease seem not only to stand up better but also to provide a seal which helps to limit the escape of the flame. THE CARTRIDGK CASK MUST BE THOROUGHLY LUBRICATED FOR THE ANALYSIS GIVEN IN THE PRECEDING PARAGRAPHS TO APPLY. WHEN A THICK FILM OF OIL EXISTS AROUND THE NECK OF THE CARTRIDGE, THE GAS PRESSURE IS NOT SEALED OFF FROM THE OUTSIDE OF THE CASE BUT IS TRANSMITTED HYDRAULICALLY BY THE OIL FILM. 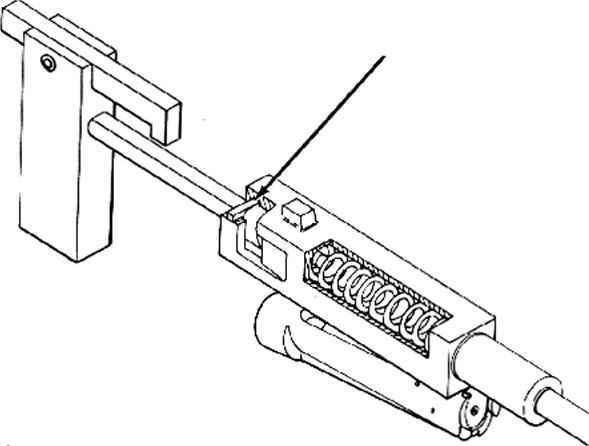 THIS CONDITION MAKES THE ENTIRE CARTRIDGE CASE ACT AS A , HYDRAULIC PISTON AND PRODUCES A REARWARD FORCE EQUAL TO THE BREECH PRESSURE TIMES THE CROSS-SECTION AREA OF THE CHAMBER AT ITS LARGEST DIAMETER. THEREFORE, WITH THE USE OF A HEAVY-BODIED LUBRICANT, THE INITIAL FORCE DRIVING A NECKED CARTRIDGE CASE TO TI1E REAR IS CONSIDERABLY GREATER THAN IT WOULD BE FOR AN UNLUBRICATED CASE, MAKING ADEQUATE LUBRICATION ABSOLUTELY" NECESSARY IN-ORDER TO OBTAIN CONSTANT PERFORMANCE. THIS IS ONE OF THE REASONS THAT THE PRESENCE OF OIL ON THE AMMUNITION IS VITAL FOR WEAPONS EMPLOYING ANY FORM OF BLOWBACK. Cartridge Case. In many iastanr.es when a gun is designed, the designer is required to use a particular type of available ammunition or at best he finds it possible to choose one of several available types. It rarely happens that a new type oi ammunition can be developed to suit the special requirements of a new gun design. In other words the characteristics of the ammunition are usually not under the control of the gun designer and he has to do the best he car l.jvMjh. what,ammunition is available to him. may have an ultimate strength in tension of approximately 50,000 psi while other materials, depending on the type used, may have an ultimate strength two or three times greater than this value. 2. Other factors influence the choice of the case material. The material should be highly elastic so that it can be expanded considerably by the chamber pressure without undergoing plastic deformation. If the material has this property, the case will more readily shrink back to its original dimensions when the chamber pressure drops to a low value, thus facilitating extraction. In addition, the material should have a large allowable elongation for suddenly applied loads so that the case can be stretched considerably without separating. only a slight taper and little if any bottle neck. The reasons why taper and bottle neck should be avoided have been explained previously under Phasf. 2 of the behavior of the cartridge case. 4. The finish and dimensions of the case should be such as to minimize frictional resistance to the movement of the case. The case should be smooth and free of scratches or other irregularities which would tend to impair the efficiency of the lubricant by causing discontinuities in the lubricant film. Also, the ease should be as small as possible in order to keep the area of the case walls to a minimum. Then for any given chamber pressure, the friction forces on the case will l>e minimized. Evaluation of the preceding characteristics will reveal that the attainment of one desirable characteristic may make it difficult or impossible to attain one or more of the others. Furthermore, it may-happen that the attempt to obtain qualities which make the cartridge more suitable for use in a blow-back weapon may introduce other problems such as poor ballistic performance or difficulties in manufacture. Nevertheless, all of these characteristics should be considered carefully in the selection of an existing cartridge for use in a blowback weapon or in setting up the requirements for a new cartridge. Close attention paid to the problem of obtaining the most suitable cartridge rase may spell the difference between succcss and failure lor a new gun design.